The last 50 years have produced a series of revolutionary technological changes. These decades have also witnessed a truly revolutionary systemic change at the global level. The change started with step-wise internal liberalisations and deregulations in the major industrialised countries. The internal systemic changes have been synchronised with the consecutive waves of liberalisation of international economic relations. Trade liberalisations (cuts in tariff levels, progressive removal of many non-tariff barriers to trade) were followed by consecutive waves of liberalisation of capital flows to a large degree completing the process of globalisation. 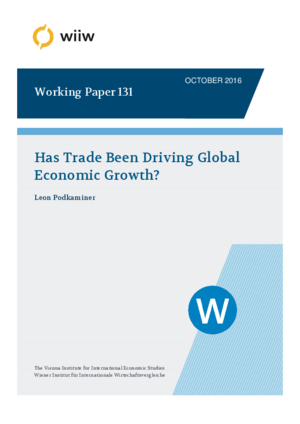 Advancing globalisation seems to have been paralleled by the global economic growth becoming progressively slower and unstable. Using the standard tools of time series econometrics (VEC, Granger non-causality testing, ARDL) the paper suggests that trade has not been driving global economic growth (or even that expanding trade may have slowed down global output growth). Large and persistent trade imbalances which have become typical since the mid-1970s are just one possible reason for trade no longer playing the positive role assigned to it in the trade theories. The second reason relates to the ‘race-to-the-bottom’ tendencies with respect to the wage rate which have developed under globalisation. These tendencies may have been responsible for the persistent shortage of aggregate demand at the global level and – consequently – weakening global output growth.